So I've had a nagging cold for two weeks now, and I'm one grumpy Crumpy. 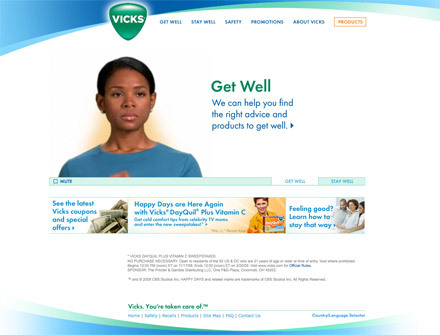 I might write up my persona as: thirty-three year old web designer, tired and a bit on the cynical side, coming to pharmacy site hoping to find a good cold/flu product via some effective design. I'm overly touchy (because of a 2-week cold) and I'm overly analytical (because I'm writing a blog post). How do I respond to the overall visual approach (layout, colors, typography, hierarchy)? How appropriate does the home page feature area feel? Does it inform or annoy? Does the main product page make it easy to get a comparative overview of what's available? Are the tools for narrowing my remedy search effective, focused, and fast? Overall visual - Not bad. Not knock-my-socks off, but homey feeling. It works. Good colors. Not too sure about the swoosh and the sidebar nav that expands to great lengths. Home feature - A commercial on autoplay. Eh, it's markety and not super useful, but I relate to that lady that feels crappy. Product page - The old rollover product menu. A bit cumbersome and not laid out well. I can't click on the product box to get details. Remedy tool - The tool is a popup, seriously? Not bad filtering options though. I would love to see some details for highlighted products within the tool. Overall visual - Nice and soft. Stands out from the other sites. 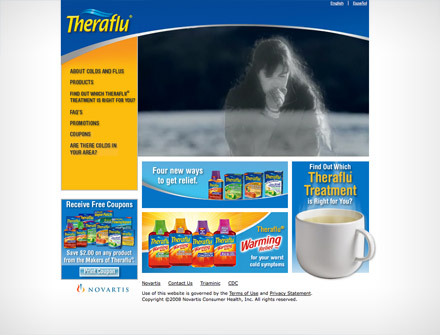 Allows colorful products, photographs, headlines, and links to really pop off the page. Home feature - Doesn't make noise, which is a plus. Generally helpful info, well-selected photography. 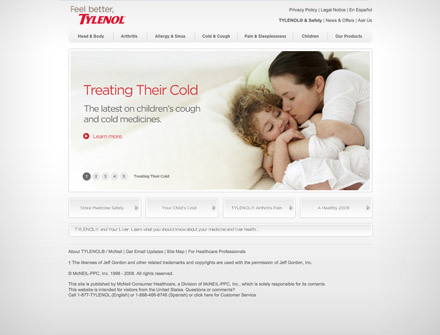 Product page - Feels like the products should be the focus and the cold and flu help info should be secondary. Remedy tool - No real tool, but I can generally filter via the content structure and functionality. Not bad. Overall visual - Still not a fan of extreme swooshes. Feels like Vicks though I guess. Strong colors. Feels cluttered. Home feature - The spacey coughing lady drives me nuts. Cutesy, and I'm definitely not wanting cutesy. The flu finder is cool. Product page - No meaningful display of the products, browsing below by product group seems one-dimensional. 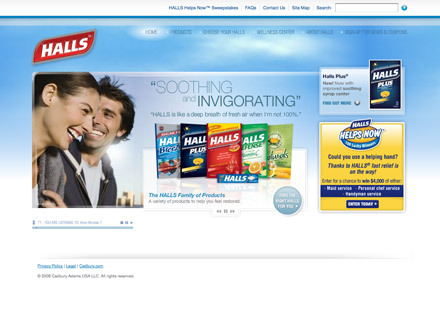 Doesn't encourage multi-symptom product identification very well. Remedy tool - Pretty slow loading. The sliders are cool. The lady who responds to my sliders, not so much (Flash time not well spent in my opinion). Overall visual - Nice look, appropriate colors. Primary nav a bit too subtle. Home feature - Smiling happy people and fanciful music ... both annoying. Causes me to ignore the product features and want off the page. Product page - Yes, a straight-forward gallery page that I can quickly scan. I like it. Remedy tool - Not bad. Simple and fast, even gives me a few options that are non-symptom related. So, simply a few comparative thoughts and some attention to sites that should be seeing real traffic increases in the coming months. I find it rather useful to do some semi-focused comparative analysis (outside of my project work) on occasion. It generates ideas, sharpens my instincts, and helps trigger aha moments later when I'm evaluating approaches for my next project.